by AFP. November 10, 2010. 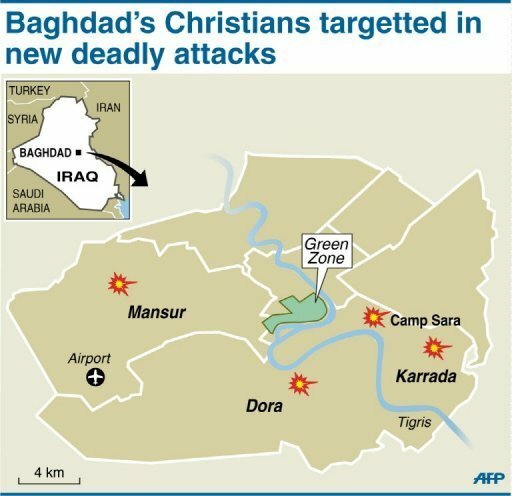 Map of Baghdad showing areas of the city where Christians have been targetted in a series of deadly attacks since Tuesday. A string of anti-Christian bombings has cost six more lives in the wake of a Baghdad church bloodbath, sowing panic in Iraq's 2,000-year-old minority on Wednesday, many of whom now want to flee. BAGHDAD, Iraq (AFP) — A string of anti-Christian bombings has cost six more lives in the wake of a Baghdad church bloodbath, sowing panic in Iraq's 2,000-year-old minority on Wednesday, many of whom now want to flee. "Since Tuesday evening, there have been 13 bombs and two mortar attacks on homes and shops of Christians in which a total of six people were killed and 33 injured," a defence ministry official said. "A church was also damaged." The attacks come less than two weeks after 44 Christian worshippers, two priests and seven security personnel died in the seizure of the Baghdad church by Islamist gunmen and the ensuing shootout when it was stormed by troops. 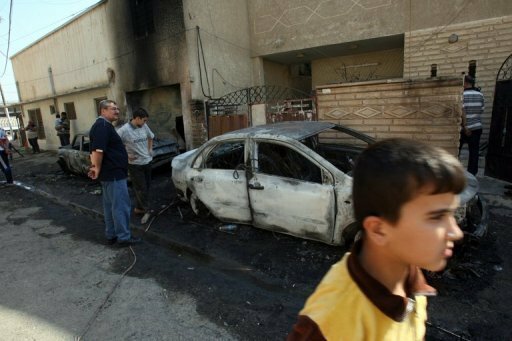 A child walks past destroyed vehicles in a mainly Christian neighborhood of central Baghdad on November 10. A string of anti-Christian bombings has cost six more lives in the wake of a Baghdad church bloodbath, sowing panic in Iraq's 2,000-year-old minority on Wednesday, many of whom now want to flee. On November 3, Al-Qaeda claimed responsibility for the hostage-taking at the capital's Syrian Catholic cathedral and warned it would step up attacks on Christians. As Christians converged on their churches on Wednesday to seek counsel from their religious leaders, the capital's Syrian Catholic archbishop made an emotional appeal for Western countries to come to their rescue. "It would be criminal on the part of the international community not to take care of the security of the Christians," Athanase Matti Shaba Matoka said inside the church targeted on October 31 where he tried to console his flock. "Everybody is scared," he said. "People are asking who is going to protect them, how are they going to stay on in Iraq. We are trying to encourage them to stay patient." 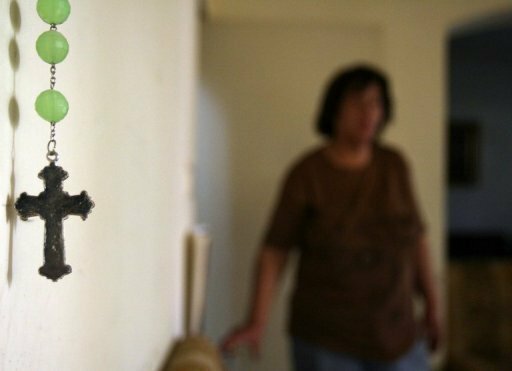 An Iraqi Assyrian Catholic woman is seen her home, in a mainly Christian neighborhood of central Baghdad on November 10. A string of anti-Christian bombings has cost six more lives in the wake of a Baghdad church bloodbath, sowing panic in Iraq's 2,000-year-old minority on Wednesday, many of whom now want to flee. The UN Security Council said Wednesday it was "appalled" by the militant attacks on Christians and Muslims in Iraq. There is "a deliberate will to destroy the Christian community" which is "on the frontline of the fight for democracy," said France's UN ambassador Gerard Araud. The UN Security Council was "appalled by and condemned in the strongest terms the recent spate of terrorist attacks in Iraq, including today's," said British ambassador Mark Lyall Grant reading a council statement. Vatican secretary of state Tarcisio Bertone described the latest attacks as "very painful." "It is a terrible suffering for all the Christian communities in the world," Italian news agencies quoted him as saying. The protection of Iraqi Christians is an issue that "we hope... will be taken into serious consideration" by the Baghdad government, Bertone added. The scarred Syrian Catholic cathedral in the central district of Karrada has become a focus of the fears of Christian families. "For the past two years now, my wife has been trying to persuade me to leave the country but I didn't agree," said 42-year-old labourer Raed Wissam from the Dora district of south Baghdad. "Today, I feel sure she's right because I don't want to feel guilty if something bad happens to one of my children." Wissam said he was woken up at 6:00 am (0300 GMT) by an explosion. "I ran up to the roof to see what was going on and I heard three more blasts, with three Christian homes targeted. My two children wept." Emmanuel Karim, a 27-year-old IT worker, was about to go to work from his home in Camp Sara, central Baghdad, when a bomb exploded. The apparent target was the car of his uncle, who was among those killed on October 31. "Fifteen minutes later, a second bomb exploded, killing a neighbour who was trying to put out the fire in the car... He was a Muslim. He was my friend," said Karim, fighting back the tears. He said the faithful were gathering at churches to try to join the Christian exodus which has been picking up pace since the 2003 invasion of now violence-plagued Iraq, where their community's roots date back two millenia. Monsignor Pius Kasha, also of the church in the hostage-taking at the end of last month, said a four-month-old baby was among three people wounded in bombings of Christian homes in Baghdad's Mansur district late on Tuesday. "We don't know what is the aim of these criminals but what is certain is that this will push even more Christians to emigrate ... Where is the security the government is supposed to provide to all citizens, Christians and Muslims?" A senior Iraqi clergyman based in London said at the weekend that Christians should quit Iraq or face being killed at the hands of Al-Qaeda. But Iraqi Prime Minister Nuri al-Maliki on Tuesday cautioned other countries not to encourage Christians to abandon their homeland, after France took in dozens of people wounded in the cathedral attack. "The countries that have welcomed the victims ... of this attack (on the church) have done a noble thing, but that should not encourage emigration," the premier said. An estimated 800,000 Christians lived in Iraq before the US-led invasion but that number has since shrunk to around 500,000 in the face of repeated attacks against their community and churches. 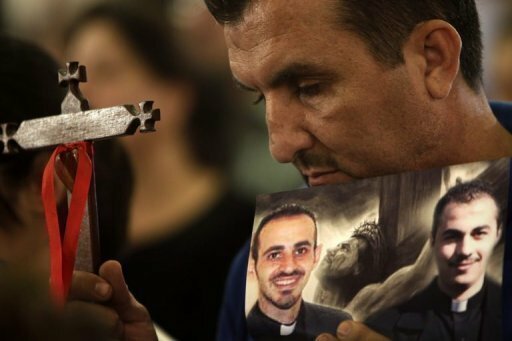 An Iraqi refugee attends a memorial mass in Beirut Sunday to mourn 46 people, including two priests, slain during a hostage crisis at a Baghdad church last month. A string of anti-Christian bombings has cost six more lives in the wake of a Baghdad church bloodbath, sowing panic in Iraq's 2,000-year-old minority on Wednesday, many of whom now want to flee.